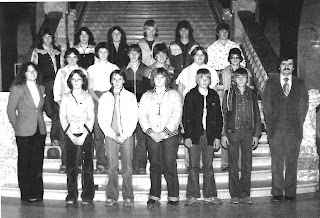 I joined the staff of Beiseker School in the fall of 1969. I had been teaching in the City of Calgary but I didn't like it. I was greatly disillusioned. I thought it was far too impersonal. I was pretty much ready to quit teaching and do something else. My move to Beiseker changed that. Beiseker was a small school then, actually it had a population similar to today's; 383 students. It had one classroom for each grade. I found the kids, their parents, and this community to be friendly and straight forward. I worked in Beiseker School for 17 years, and I was saddened when I was transferred to Crossfield. The Bi-Campus & Tri-Campus; To offer a larger program of courses to high school students, Beiseker School paired up with Kathyrn School and offered high school courses in each school. Later Beiseker and Kathyrn joined with Acme School to form a Tri-Campus, offering different high school courses and programs in all three buildings. To my knowledge, this was the first and possibly the only Tri-Campus program to operate in Alberta. What is even more amazing was that it also involved two school divisions (Rocky View and Golden Hills)! The "E.O.F." Program; The Elementary Opportunities Fund was set up by the provincial Department of Education and given to individual schools to offer different programs to their elementary students. Beiseker School received such a grant. Here the grant was used to give any student a short little boost in learning in one small area of either Math or Language Arts. The Girls' Boot Room in the basement of the original school building was converted into a classroom and a teacher (Miss W. Abbott) was hired. Our E.O.F. Room ran very successfully for three years until the government pulled the funding for the entire province-wide program. The Sports Programs; I think Beiseker had Rocky View's first (and perhaps only) cricket pitch! Mr. S. Wallace was a champion Cricket bowler (pitcher) and played on the Canadian National Cricket Team. While teaching in Beiseker, he taught cricket to his students! The Bi-Campus (and later just Beiseker School) has fielded many top sports teams over the last 50 years! Many of those championship banners proudly hang in the Gym now. Next time you're in there have a look at that impressive display! Remember: Once a Beiseker Bandit, always a Beiseker Bandit!! Industrial Education; Beiseker School was the first school in this entire area to offer an Industrial Arts Program with a full shop! The shop was constructed in a temporary prefab building immediately south of the original main building. It offered welding, photography, graphics, woodworking, automotives, and metal working. That shop was replaced by a more permanent structure more than 10 years ago. The Community School Program; In the early 1980s, Beiseker School was one of over 100 schools from across Alberta to apply to become a Community School. A Community School was one that worked much more closely with the community around it. Programs and the curriculum were tailored to the needs of that community. Instead of a school being open just 200 days a year, a Community School could be open more than 300 days a year! Of course that costs money, so the provincial government set up a large fund to help offset those extra costs. Beiseker was the only school in Rocky View to attain Community School status! Unfortunately the provincial Community School project funding was terminated in the late 1980s but the Beiseker Community School moniker proudly remains. These are just five programs which made Beiseker Community School just a bit more special. Teachers, Administrators, and students, past and present have much to be proud of. I hope you all get a chance to visit Beiseker Community School during the reunion set to begin on Friday, June 12 and continue over that weekend. Check out those banners in the Gym, search for a familiar face or name on the grad photos in the hallway, leaf through the old yearbooks. Be proud! Becoming a community school was a long and involved process. A Community School Charter had to be written by a committee composed of school officials, teachers, students, community leaders and interested citizens. The process took more than two years. Of the more than 100 schools to apply for Community School Status, only sixty six were declared Community Schools. One ended up closing so only sixty five opened as community schools. Beiseker Community School was one of those 65!